Hollywood star Robert De Niro has never minced his words when it comes to US President Donald Trump. He has now called him “a real racist” and a “white supremacist”. In a recent interview with the Guardian, the actor said that there was a time in his life when he was willing to take a chance on Trump. "I'm older now and I'm just upset about what's going on. When you see someone like (Trump) becoming president, I thought, well, OK, let's see what he does, maybe he'll change. But he just got worse,” De Niro said. Not withholding anything, he added, "It showed me that he is a real racist. I thought maybe as a New Yorker he understands the diversity in the city but he's as bad as I thought he was before, and much worse. It's a shame. He agreed on Trump being a “white supremacist” and said being a ‘fascist’ follows white supremacy. He said, "If he had his way, we'd wind up in a very bad state in this country. I mean, the way I understand it, they laughed at Hitler. They all look funny. Among many other things that he mentioned, the actor said that there is a bigger danger lurking, and that is if the future generations look up to him as an example and start to emulate him. He said, “They'll be affected in some way, but they'll be a lot smarter and have many more colours to their personality and be more mercurial and become someone with the same values as he has but able to get much further and do more damage as a despot. That's my worry. "There are people who look up to him: 'I want to be like him'. But they'll do it much better and they'll be more smart about it," he said. Will the actor ever play Trump in a film? De Niro said an emphatic no in the interview and explained his decision: "I always find the character's point of view and I can of course find his, but I have so little sympathy for him, for what he's done, the responsibility he's been given and just thrown away. De Niro has always been criticial of Trump and his policies. He had once even said "F**k Trump" as he appeared on stage at the Tony Awards last June. 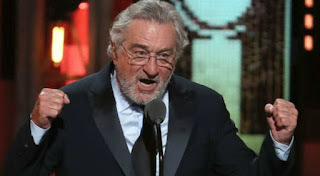 In a reply to this, Trump then wrote on Twitter: "Robert De Niro, a very Low IQ individual, has received too many shots to the head by real boxers in movies. I watched him last night and truly believe he may be 'punch-drunk' (sic)"